I had my first encounter with a GPS system in a taxi today. Apparently this is some new experiment courtesy of the RTA in which a small percentage of taxis have been set up with GPS to somehow make it easier to get you to your final destination. Keep in mind, Dubai doesn’t have a proper address system in place, which, while not rendering GPS useless, does turn it all into more of a farce. After the driver explained the new addition to me, he asked if I had a suggestion for how to get to my home instead of following the GPS. I took one look at that presumably untrustworthy hunk of plastic, thought ‘no, this does not bode well,’ and proceeded to tell him the way I wanted him to go. Immediately ignoring me, we set of in precisely the opposite direction of home, because that’s what the GPS told him to do. 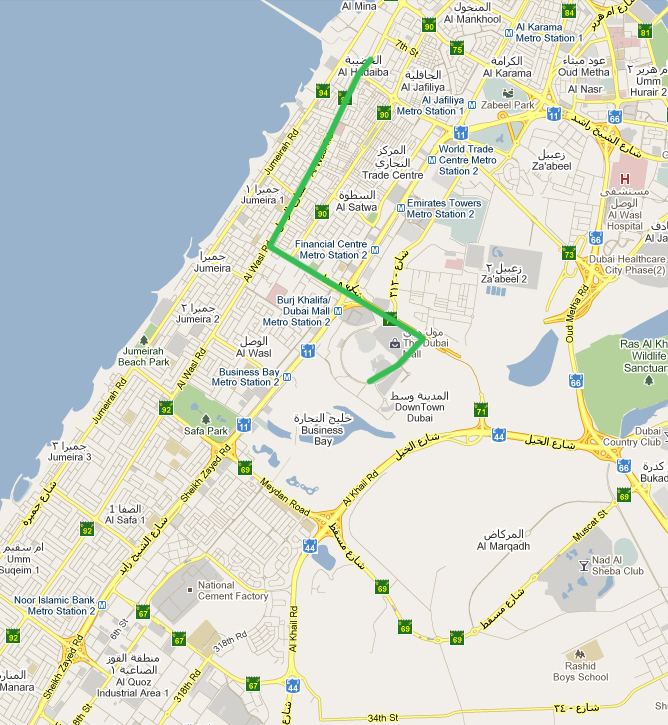 ‘Do you not know where Wasl Rd is?’ I ask. He replies that indeed he does, but the GPS told him to go in the opposite direction and the RTA has requested he follow the GPS’s instructions. Then why even ask me to suggest a route home, only to totally ignore my request? It took me some time to convince him to stop listening to the GPS (which at every opportunity tried to take us as far off course as possible). Even when my building was in sight, just a couple hundred yards straight ahead, the GPS was telling him to go left, and I’ll be damned if he wasn’t listening to it despite my protests (I did convince him to not turn left in the end, but not not without practically pleading). 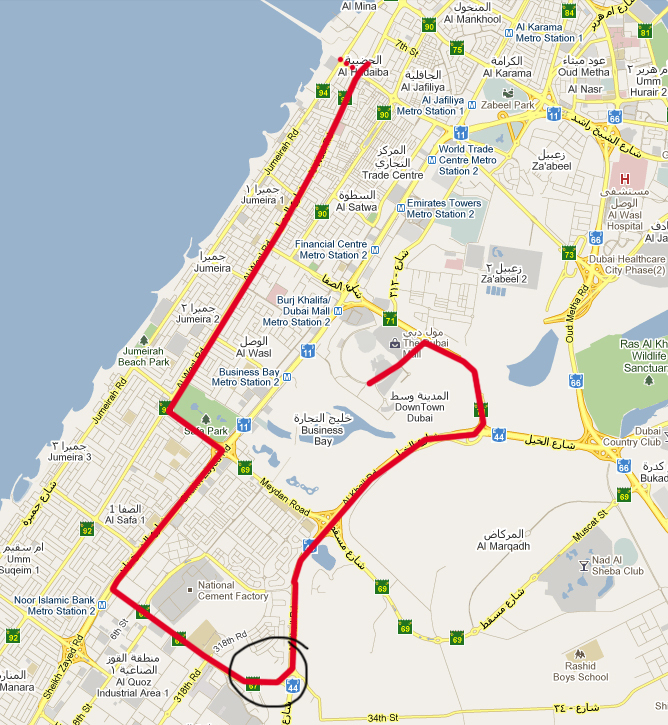 the red line represents the GPS' instructions. the black circle is where I finally convinced the driver to turn off the GPS route (I had been trying since the 1st right turn). the dotted red line is the GPS desperately trying to go off course again at the final intersection near my building. I think next time I get into a taxi outfitted with GPS I will be getting right back out.